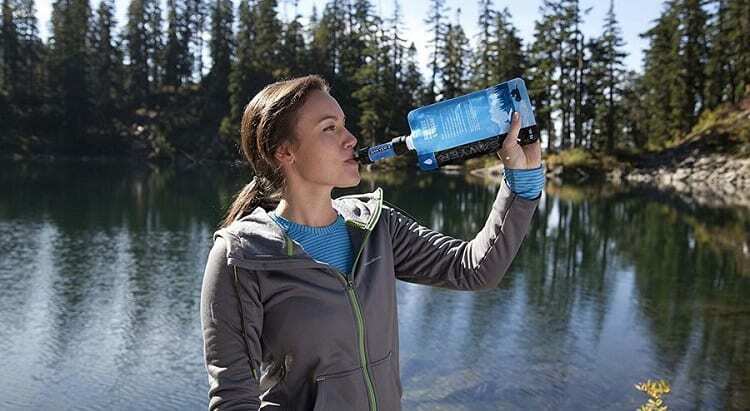 In the following guide, we aim to answer that question by offering an in-depth review of the best camping water filters currently on the market and a detailed analysis of what goes into the making of the ideal water filter for every type of camping. Let’s start off with our top picks of the best water filters per category for 2019. The company and product that started all the awareness about access to safer water, LifeStraw is the flagship personal filter for just about every scenario. We talk a lot about viruses and protozoa in the buying guide below, and while a filter isn’t enough to get rid of all of them, this 0.2 micron filter can avoid most of them. 0.2 microns has a very slow output, so please remember that this is a personal filter system designed for single use. LifeStraw is fairly labor-intensive to use, as it requires a lot of force and sucking to achieve clean water, but the point of the matter is you’re still getting clean water out of it. Using a hollow fiber membrane, you’re able to output a massive 1,000 gallons of clean, drinkable water out of this tiny little straw. We can’t even imagine using this on that much water, which is why it’s the perfect bug-out bag essential and survival necessity: it over-prepares you for everything. LifeStraw also tests their products through far more than just the EPA’s safety rating, including the NSF and ASTM that help regulate viable water filters on a global scale. LifeStraw is also a purchase you can feel good about. They match sales with one year of safe drinking water for school-aged children in hardened areas around the world, promoting their mission statement of providing clean water for global needs. 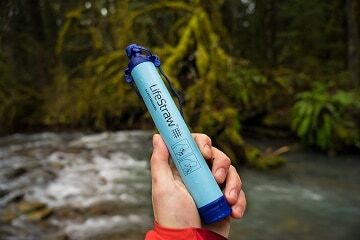 LifeStraw weighs about two ounces, and is extremely compact; you won’t even know it’s in your backpack because it’s not going to take up much space at all. If you need a higher output, or if the straw design just isn’t for you, Katadyn has a stellar solution. For two to four-person camping parties, this pump system provides you with a larger supply of water in a very short amount of time. You’re able to get one liter of water for every minute of pumping, and the entire system is field-cleanable, meaning you don’t have to dip out of your trip early just to find an indoor water supply and clean this out. In their spirit of being durable and versatile, you’re also given a sleek steel exterior to keep this protected against the elements. 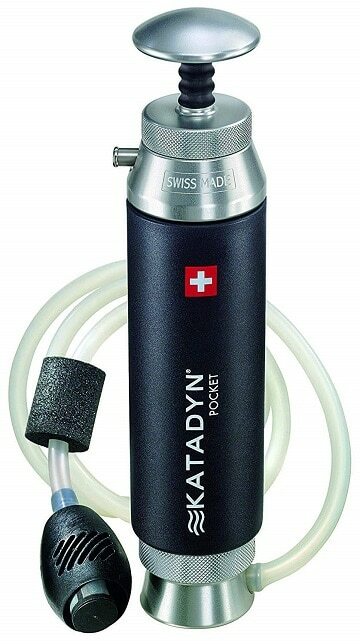 Katadyn isn’t an inexpensive option by any means, but the low micron rating helps filter out almost all strands of protozoa and giardia, as well as some algae found in freshwater streams with stagnant spots. Great filtration, high output, and lastly, simple operation. All you have to do is pump it through the ceramic filtration system, and start enjoying clean water. But even being premium and built out of high-end components, Katadyn still faces a problem. The carbon cartridge bottle adapter is sold separately, and for this price, that’s a bit of a let-down. Replacement tubes and filters aren’t that expensive though, and this system is rated to last for 13,000 gallons of water before it’s recommended to replace the entire unit. For more output and a more reliable system, one that doesn’t require much personal labor, Katadyn is an excellent solution. We don’t like to imagine survival-based emergency situations, but we still have to prepare for them. If you’re a family man who has kids to look after, or you’re just a dad who wants to get high levels of clean water on the campsite every weekend, Platypus has the design for you. You simply fill the marked bag for dirty water, and hang it up on a higher tree branch than you hang the clean water bag. They’re both clearly marked and color-coded, preventing mix-ups. Use the included straps to hoist it up, and let gravity do the work. The dirty bag feeds water through the filter in the center of the hose, and feeds the clean water into the appropriate bag. This low micron filter helps remove 99.9999% of all waterborne bacteria and protozoa, which is as good as you’re going to get from any filtration system without also boiling the water (more on that in the buying guide below). This meets EPA and NSF guidelines, so you know you’re getting a quality filter. The only downside is that those hanging straps have a weak plastic buckle closure, but the nylon in the straps themselves is good quality. It takes about two and a half minutes to filter four liters of water, and each filtration cartridge has a lifespan of 1,500 gallons before needing to be replaced. The system itself, so long as it’s cleaned and stored properly, has no life expectancy on it, so long as you’re actually changing the filters when needed. Lastly, the hollow fiber filter doesn’t leave a taste or flecks like carbon filters do, but still makes the water taste great. p>We know LifeStraw is the best, but there needs to be some more spotlight on their Go Bottle. This is their underdog product, but it’s the perfect solution for hikers who aren’t looking to pitch a tent and stay a while. You get the full power of the LifeStraw design in the center spire of your bottle, filtering water through a two-stage carbon filter. Unlike those dollar stove “filter bottles” you’ve seen, this one doesn’t leave black flecks or a nasty taste in your mouth. Carbon usually gets a bad rep, but is one of the most effective and inexpensive ways to filter water. You’ll get twenty-two ounces of capacity, so you can fill up from the stream and keep going. There’s a lanyard that’s built into a plastic ring just under the cap, and includes a nylon loop with a metal hook: that’s about as durable as you’re going to get without sewing it onto your backyard. The bottle is made fully BPA-free, created with an EPA approved design, and features a comfortable silicone mouthpiece so you’re not cracking hard plastic against your lips and teeth. With anything, there are some downsides. For one, it has a low whistling sound during suction, and also features a sort of dodgy cover. It’s leak-proof if you seal it like a pickle jar, but otherwise, placing this on its side can result in light leakage from around the cap. LifeStraw matches sales with the promise of clean water for school-aged children in areas of the world that usually don’t have access to clean drinking water, making you feel good about the brand you’re choosing. Last on our list if GRAYL, a relatively new player to the game. These guys produced something truly spectacular: a three-stage filtration system that used ceramic fiber, ion exchange, and activated carbon to purify water (as much as it can). There’s no real way to get 100% pure water without boiling it, but GRAYL promises 99.9999% of all waterborne viruses, bacteria and protozoa will be removed, and based on their filter system and certifications, we’re inclined to agree. Compared to the LifeStraw Go, the total life of each filter is fairly low. You only get forty gallons per filter, and while it’s a complex system that handles it, it’s still monetarily disappointing. But where GRAYL picks up the slack is with usage: you fill the bottle, and apply pressure to it to begin the filtering process. It takes fifteen seconds to get two fluid cups of water, saving you time compared to “sipper bottles” like the LifeStraw Go. GRAYL is part of the 1% for the Planet foundation, providing 1% of your purchase price to help environmental projects around the world. Every little bit helps. 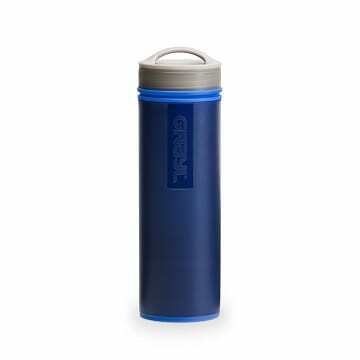 This is the ideal travel cup if you’re backpacking across countries with high lead volume in their water (such as India or Indonesia), and leaves a fresh taste after every single sip. There’s nothing crazy to it; fill, push down, and you’re going to have clean drinking water. A handful of these for individual bug-out bags would be fantastic. It’s about efficiency and survival over aesthetics, so we need to make sure that you’re walking away with the best portable water purifier to fit your specific needs. From understanding certifications and brands to exactly what lives in unfiltered water, we’ve covered it all. If you’re heading to the campsite for a weekend, you’re trying to pack as ultralight as possible so you’re not wrecking your back carrying everything there. While even the most hefty camping water filters don’t take up a lot of space, every little bit helps. 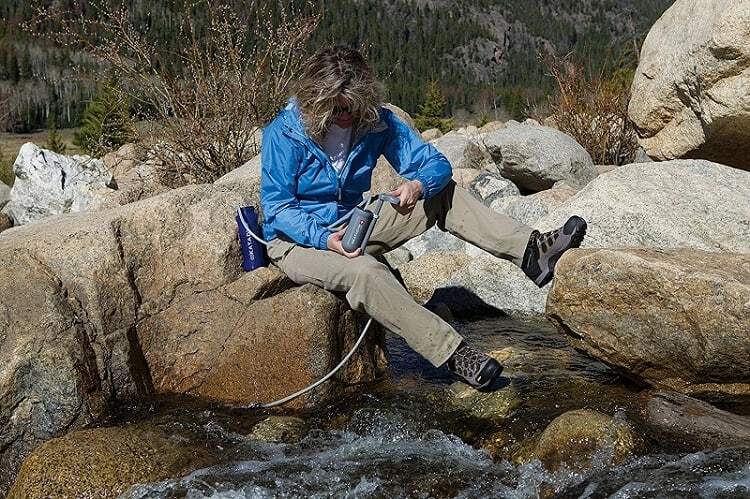 Most camping water filters are designed to be compact and lightweight. You have multiple systems: straw, gravity, and pump, which we’ve seen displayed in the selection we’ve chosen. The best water filtration system backpacking veterans use is a gravity-fed system, but a straw-based filter is best for bug-out bags and survival situations due to being lightweight and compact. We’ll describe the details of each type later on, but they greatly affect your decision. This defines how much it’s going to output before the end of its life. Thankfully, most systems are rated to supply you with an insane amount of water. For a single person having the recommended daily dosage of a half-gallon, a LifeStraw could sustain you for five years if you drank from a stream every single day. Pay attention to the maximum output, but know that this is least likely to impact your purchase decision since most brands do a good job at providing great outputs. You have personal filters, like LifeStraw, or the Platypus system that has a much higher flower rate and provides more water in a single use. The flow rate is all about practicality, and higher flow rates generally come with a higher price tag no matter what brand you’re looking at. That’s what you need to be asking yourself before you commit to the purchase, especially if you plan on using this often. Straw-based systems are simple and sustainable, but you have a lot more moving parts in a pump or gravity water filter. You’ll find a lot of helpful information in user reviews for the sustainability of systems with more than one working part. Not all filtration systems are certified, and some are only EPA certified. As a rule of thumb, you should not be impressed with only one certification on a product. Be on the lookout for separate organization certifications, like COSUPA, who are widely accredited for accuracy. What Are the Different Types of Water Filters? Straw-Based – The LifeStraw and other products similar to it, have all revolutionized how the world has access to clean water. They can take a lot of force and suction to use properly, and don’t collect water (you ingest it directly through the straw), but are great for survival situations and bug-out bags. Gravity Fed – Looking for high volume without having to break your back? Gravity fed systems are perfect for you. These have separate storage compartments for “dirty” water, and another bag that hangs lower for clean water. 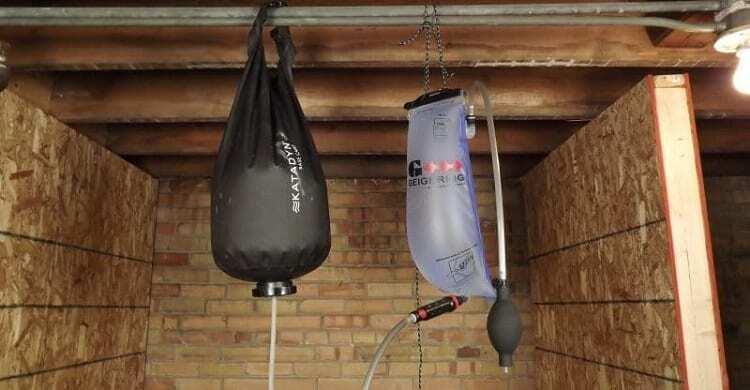 Using a hose and the central filtration system, gravity does the work for you, often giving you one liter of water per minute (for most basic gravity systems), all by simply hanging up a bag. You’ll need to clean these out thoroughly, and possibly replace tubing often. Pump Activated – These work with a bit of manual labor, but not as intensively as a straw-based filtration system. Using a lever or pump, you gently run water through the carbon filter, and receive clean water on the other side. These have more moving parts than a straw-hased filter, but are not as complex as a gravity fed system. Can Water Filters Removes Viruses? Even when filtering water with a 0.01 micron filter (essentially the most narrow filter), you cannot guarantee that viruses, bacteria, and protozoa are not present in the water. There’s a difference between a filter and a purifier. A filter removes high amounts of chlorine, pharmaceuticals, chemicals, lead and mercury, which purifying doesn’t. You need to halves of the same system to work. So even if you’re filtering your water, you still need to boil it. When you look at personal systems like the LifeStraw, they’re more used in survival-based scenarios when taking a risk on ingesting protozoa, which may or may not make you sick, is better than the alternative of death via dehydration. You can filter water and still have bacteria in it; you can purify water and still have lead in it; you need both, plain and simple. How Long Can Viruses Live in Water? Way longer than people assume, which is what gets them into trouble. 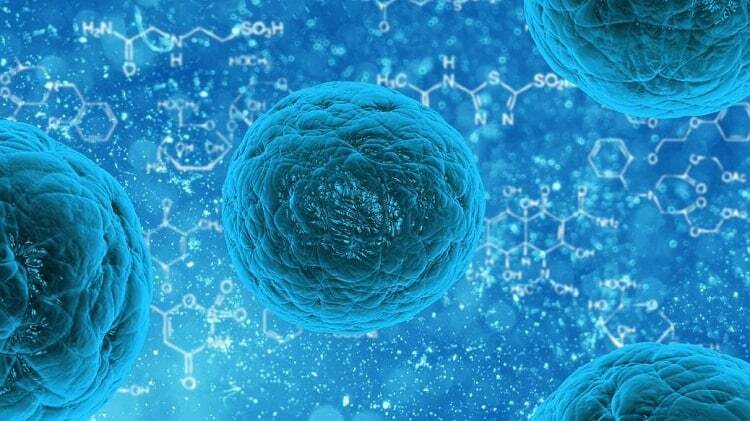 Waterborne viruses have far too recent a history, and are responsible for nearly hundreds of millions of deaths in the last seventy years alone. 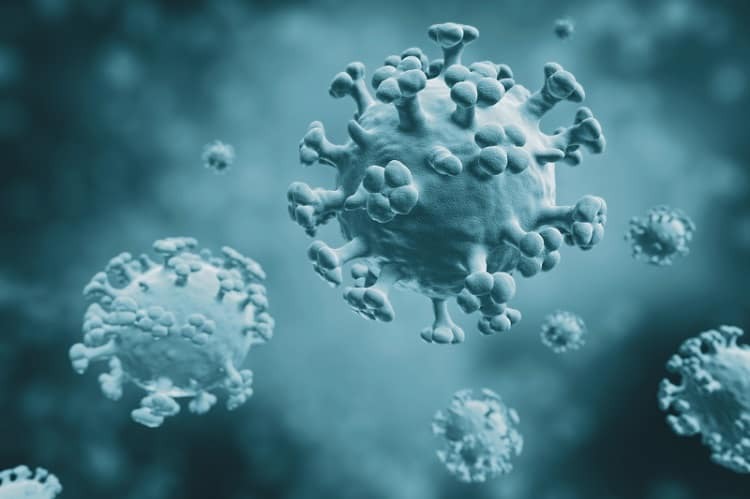 Norovirus, rotavirus, torovirus and other strands of viruses are naturally found in water, and can sustain life for three weeks without anything to feed off of. Temperatures are what keep these viruses alive. When they’re between a certain range, they simply don’t die-off, and other factors go into it as well like pH levels, organic matter, sediments, and light. Generally speaking, sunlight is good for these bacteria to thrive. It’s only when high density UV light is introduced that viruses can be killed, or when introduced to a rolling boil. Do Water Filters Remove Giardia? 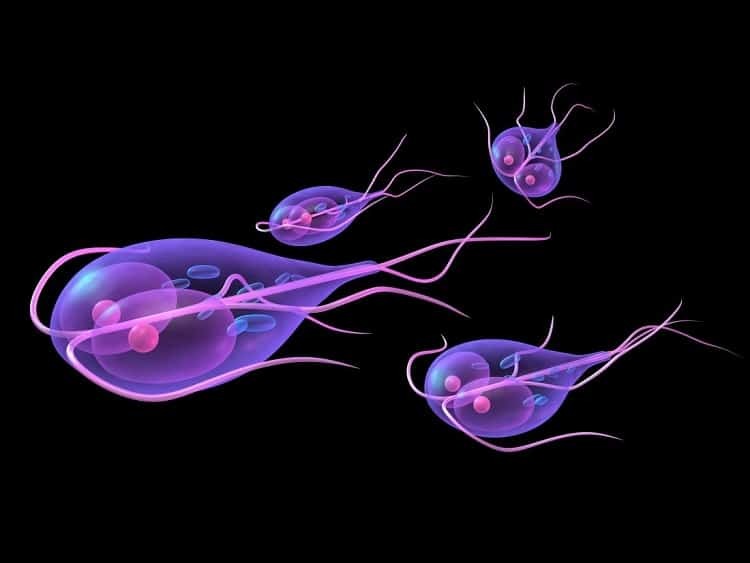 If you don’t know what giardia is, it’s the causing parasite of giardiasis, which can cause long-term damages. You can feel symptoms for up to three months, because this parasite literally dissolves your intestines (or at least tries to). Thanks to medical analysis technology and the average human body, you can generally recover from these issues in five to seven days, but you definitely won’t be able to continue your camping trip if you ingest giardia. Giardia isn’t filtered thoroughly by your water filter; it needs to be boiled and killed. The reason being is that the temperature range for giardia to thrive is a fairly average temperature, one that you encounter on camp and hike-worthy days, and is so small that it comes right through the carbon filter on your water filter. You need to boil your water to get rid of it, no matter what. Boiling water for an extended period of time can kill bacteria, pathogens, viruses and protozoa, which are basically what your filters are aiming to do. However, as we’re all aware, it’s not always easy to boil water when you’re out on the camping trail. You could use a camping stove, but you’ll need to ensure that there’s enough power (BTUs) to actually bring the water to a rolling boil and kill that bacteria. Boiling water is technically the safest method of achieving clean, potable drinking water, and it can work in tandem with your portable purification system. If you’re building a campsite to stay for an extended period of time, you can opt for a system like the Platypus gravity bag, which is designed to give you a high volume output, can be your best friend. When possible, you should purify water before boiling it to ensure that as much bacteria as possible has already been removed from the water. Boiling water, as we all know, transforms some of that water supply into vapors that minimize your overall water amount. You should achieve a rolling boil for no less than two solid minutes to effectively terminate all harmful bacteria, but there’s a trick involved. For every mile of elevation, you need to increase your boiling time by one minute. At 5,200+ ft of elevation, bring to a rolling boil for three minutes, and so on. We mentioned that the answer to this question is yet and no, and that’s because using a purification system and boiling your water is a two-step process. One without the other doesn’t necessarily poise you for the best-tasting water. If you boil it first and it still appears cloudy, purify it. If you’re grabbing it right from the stream to boil, consider purifying it first. One does not necessarily cancel out the other. How Often Should You Change Your Carbon Filter? As a rule of thumb, you should change it out every six to twelve months. That time frame starts after its first use, even if you don’t use it for weeks after the fact. You’re bringing in all the toxins, potential diseases and bacteria from that water, and while you’re getting purified, clean drinking water on the other end, those bacteria get stuck on the filter. They can’t get through, but they will breed, and eventually overwhelm the filter/find a way around it. This is why many water filter companies ensure their products for over 1,000 gallons: you’re reasonably not going to use that much, even if you live outdoors and strictly drink from streams and rivers. The average human is supposed to drink a half-gallon of water every single day, equalling less than two-hundred in a solid year. One water filter would be good enough to support five people drinking a half-gallon per day, for an entire year. That’s how much power is behind these. I Didn’t Keep Track; How Will I Know When It’s Time to Switch It? There’s a noticeable taste difference. If you’ve ever just drank water straight from a stream (let’s hope you haven’t), you’ll know that there’s a distinct earthy, metal taste to the water. We’re aiming to get the same visible clarity and clean taste as store-bought purified water. Your body can naturally, to some extent, detect when something is bad for you. When you get that wretched taste of unpurified water in your mouth, it’s something you’ll never forget. If you’re not certain when you’ve switched the filter out last, you can either look at your online order history to find the delivery date and trail back from there, or simply watch out for a change in flavor. Choose one of the best water filtration system backpacking veterans use on every camping trip, that seasoned pros use on their hikes, and have some peace of mind in knowing that you’ll have a far more durable means of protecting yourself from microbes, diseases, and upkeeping your hydration in survival situations. Feel free to check out our other guides on camping, hiking and RV gear to get the most out of mother nature, every single time.